This column has often featured rare Real Photo postcards from the early 1900s. Such postcards provide uncommon and unaltered views of historic Rock Island. Their rarity is due to the process by which they were created: Each postcard was individually printed using a negative and photographic paper. This method is different from the lithographed color postcards of the same era that were mass-produced and hence more widely circulated. The two types are easily distinguished using a magnifying glass. Under magnification, the vintage color postcards are seen to be composed of individual “dots,” just like today’s newspaper reproduction. The presence of those dots means the postcard cannot be significantly enlarged to show more detail. In contrast, the Real Photo cards can be enlarged many times, making details, such as writing, signs, even newspaper headlines readable. Commercial Real Photo cards typically had an identifying caption placed on each negative which appeared on the final print. Today’s postcard, from the collection of Shannon Hall, is completely unidentified except for a personal message and postmark on the back. Without that information, there would be no way to identify its subject as Rock Island. It was likely a one-of-a-kind postcard, created by a local photographer, perhaps the man who mailed it. The very casual, poorly composed picture, lends credence to this theory. He may have taken several pictures on a roll of film, then had them printed on special photographic paper which had its reverse side imprinted with a postcard format. What riot? It didn’t take long to verify that this was the infamous riot begun by gangster John Looney’s minions. A couple of weeks earlier, Looney, the publisher of the infamous scandal sheet, the Rock Island News, had printed inflammatory and untrue stories about the mayor of Rock Island, Harry Schriver. In retaliation, Schriver had Looney arrested and brought to City Hall, where he savagely attacked Looney, continuing the beating until he had forced an apology. But John Looney was not so easily dismissed. Four days later, on March 26, 1912, a crowd gathered in Market Square, on 17th Street between Second and Third Avenues, to hear inflammatory speeches by Looney friends. According to the Argus, a group of “outsiders” started harassing police who retreated to City Hall on Third Avenue at 16th Street. The crowd, now an uncontrolled mob of a thousand, followed the police and began to throw bricks through the windows and fire shots into the building. Police retaliated by first shooting over the heads of the rioters and then into the crowd. The riot did not end until dawn the next day after 600 National Guard troops from nearby cities arrived to patrol the city. 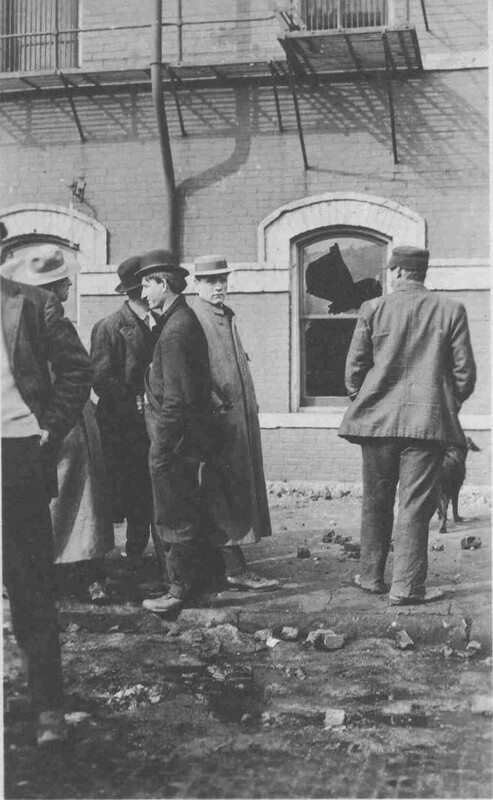 The postcard shows a window completely broken out of a building, with chunks of rocks lying in the foreground. Several neatly dressed men, some in suits and others in long overcoats, are looking in different directions. All wear hats or caps and most have their hands in their pockets. There’s even a dog in the picture. 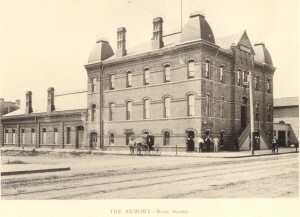 The Augustana scene is identified as “Rock Island, Old Armory, City Hall Building,” and was taken on 16th Street looking north toward Third Avenue, the same location as today’s city hall. It is a larger view of the postcard building, and shows that it is three stories high and is topped at each corner by a Mansard-roofed tower. The arch-topped windows and horizontal stone bands, even the fire escape near the top of the postcard, are clearly visible. With this information, the postcard location can be clearly pinpointed: It shows the 16th Street side of old City Hall, about 20 feet south of the Third Avenue sidewalk. 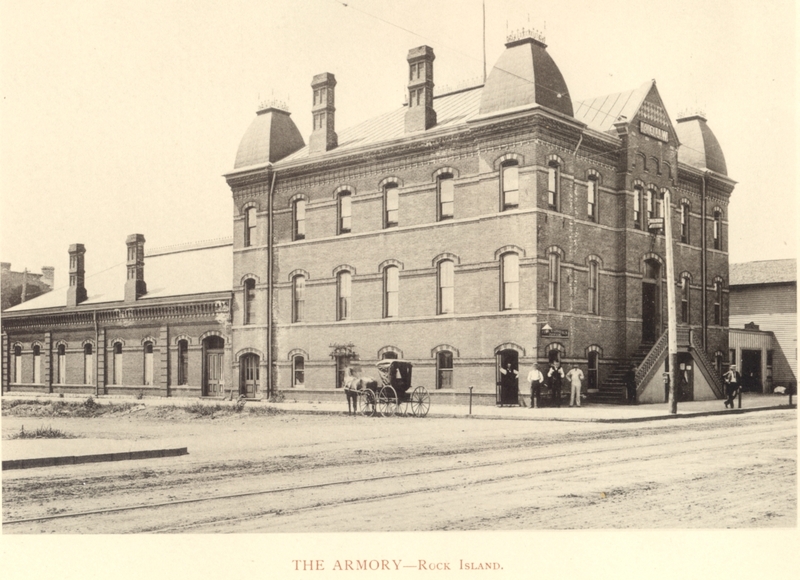 An even earlier view, published in 1893, shows the full east side of the the City Hall and Armory. Very little changed between that photo and the one taken in 1919, except for the addition of dormers on the lower back part. There remains an unanswered question. Who are the men on the postcard? Although unidentified, the photo is clear enough that some may be recognized by our readers. Are they city officials? Curious citizens? If you know, please tell us. This article by Diane Oestreich is slightly modified from the original, which appeared in the Rock Island Argus and Moline Dispatch on February 6, 2005.